Kristin Wellman joins the pediatric urology team having obtained her Master of Science in Nursing from the University of Alabama at Birmingham, with a concentration in pediatric primary care. Along with her MSN, Kristin is board certified by the Pediatric Nursing Certification Board. Kristin began her career with Children’s Healthcare of Atlanta in 2009. Her previous nursing experience includes working in the emergency room at Scottish Rite, Egleston and Hughes Spalding. While at CHOA, she was also on the Clinical Practice Committee where she worked to improve the quality of patient care through evidence-based research. 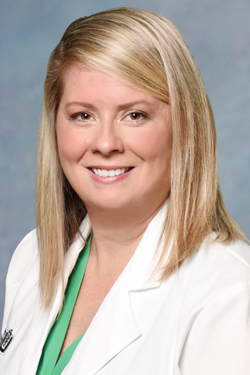 Her combination of acute pediatric experience and primary care education allows Kristin the opportunity to provide the best patient care at Georgia Urology. Kristin currently resides in Atlanta, Ga. Her hobbies include outdoor exercise, cheering for the Atlanta United FC, exploring new dog parks with her Australian Shepherd and taking beach trips with her family.